NBC/WSJ poll: Obama holds lead in Ohio; statistical tie in Va., Fla. Updated at 9:01 a.m. ET: As President Barack Obama and Republican presidential nominee Mitt Romney prepare to square off for their first debate Wednesday night, the Democratic incumbent maintains a significant lead in one key battleground state while the contests in two others have tightened, according to a new round of NBC News/Marist/Wall Street Journal polls. In Ohio, Obama holds a 51 percent to 43 percent lead among likely voters, which is relatively unchanged from his 50 percent to 43 percent lead three weeks ago. In Florida and Virginia, Obama and Romney are statistically tied, with the Democrat clinging to a slight edge. In Florida, Obama leads 47 percent to 46 percent, down from 49 percent to 45 percent in mid-September. And in Virginia, Obama is up 48 percent to 46 percent. Last month, Obama led 49 percent to 45 percent in the Old Dominion state. "The polling in September was right after the conventions," said Lee Miringoff, director of the Marist Institute for Public Opinion, which conducted the poll. He added, "We may be seeing a dissipation in some of that post-convention bounce that [Obama] enjoyed." Miringoff also noted, "Things have returned in Florida and Virginia to the kind of closeness we've been seeing earlier in the campaign. Not so in Ohio." As the presidential candidates' running mates duke it out over Vice President Joe Biden's use of the word "buried" to describe the fate of the middle class over the past four years, conservatives circulate a video of a 2007 speech by President Obama, a move described as "desperate" by his campaign. NBC's Chuck Todd reports. These three states are where the campaigns have focused the lion's share of their resources. Of the $687 million in total advertising spending between the campaigns and outside groups, more than half -- $384 million -- has been spent trying to tip the 60 electoral votes in this trio of battlegrounds. Women's support for the president and a continued negative perception of Romney are fueling Obama's lead in Ohio. There is a wide gender gap in the Buckeye State, with women saying they prefer Obama over Romney by a 56 percent to 39 percent margin. A majority of all Ohio voters (51 percent) view Romney negatively; just 42 percent view him positively. It was the reverse for Obama, who enjoys a 52 percent/favorable, 44 percent/unfavorable score. "Ohio needs to change if Romney's going to make that state more competitive," Miringoff said. In Florida, though, it's a different picture. 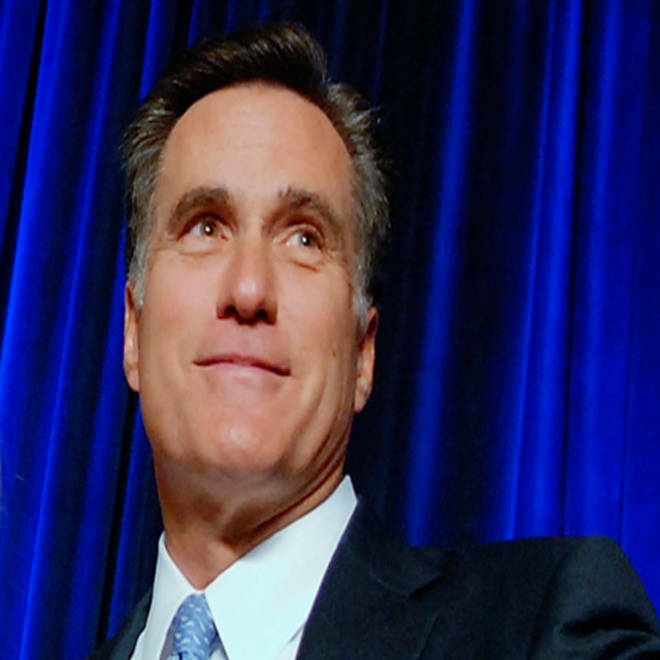 There, Romney's image is in better shape -- 46 percent view him positively, while 43 percent view him unfavorably. That may not seem like much, but that three-point, net-positive score is Romney's best in any of the nine battleground states tested in the NBC/Marist/WSJ polls following the political conventions. President Obama's deputy campaign manager Stephanie Cutter talks to TODAY's Savannah Guthrie about the candidate's skills as a debater as well as his biggest vulnerability heading into the first debate. In the last Florida poll, Romney was plus-two in positive feelings; in Virginia last month, he was plus-one, just as he was in North Carolina last week. All of the other states have shown Romney with an upside-down score. Though Obama is a slightly higher net-positive (50 percent to 45 percent) in favorability in Florida, his negative score is actually higher than Romney's. 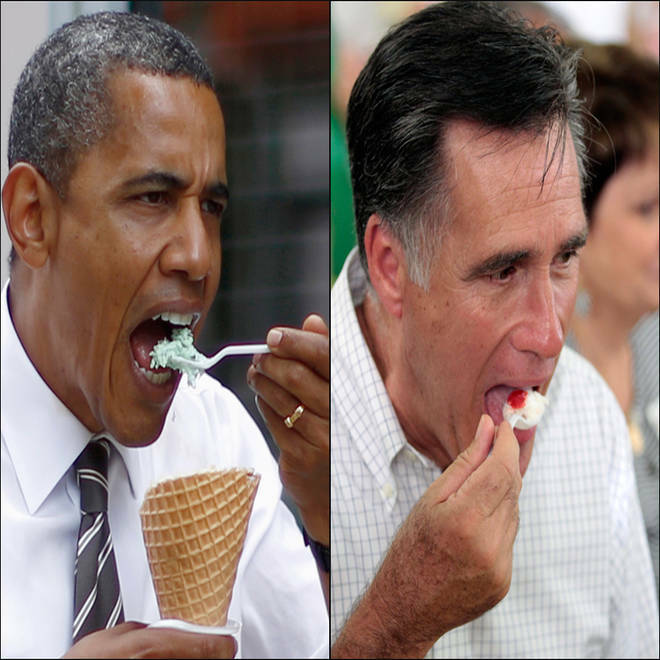 From tramping through cornfields to munching ice cream cones to holding babies – the time-honored traditions of the campaign trail leave President Barack Obama and GOP challenger Mitt Romney looking surprisingly alike. The movement in Florida came from independents. 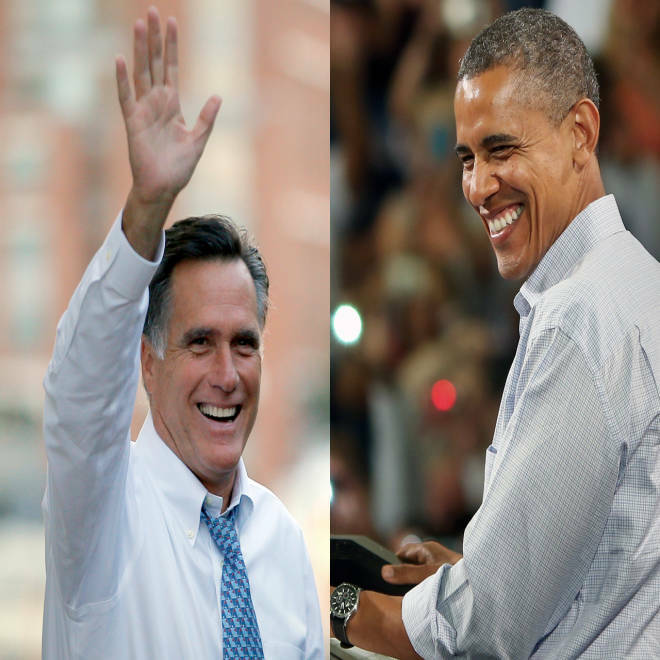 Both parties are locked in, but in this survey, independents broke for Romney 47 percent to 41 percent. 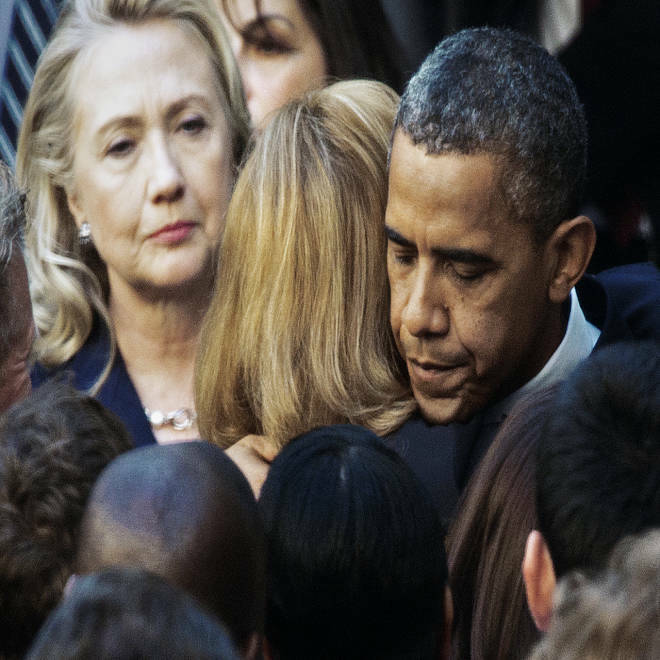 Three weeks ago, Obama led with them 48 percent to 41 percent. Virginia saw minor shifts across several groups accounting for Romney's two-point gain. The president has a 48 percent job approval rating across all three states, a number Miringoff calls a "good number for an incumbent." But "it's not a great number." "It's right on the edge of where someone seeking re-election needs to be," Miringoff said. Although the race is tight, Mitt Romney is inching forward, making the upcoming debates between the presidential candidates even more crucial. In the latest NBC/WSJ poll, nearly 40 percent said the debates will be either 'extremely' or 'quite' important. NBC's Chuck Todd reports. As the candidates and the country look to first of three presidential debates Wednesday night, it's worth noting that within these three polls, there was a very low number of undecided or persuadable voters – something reflected nationally and in other swing-state surveys as well. "Typically debates are aimed at winning undecided voters," Miringoff said. But there may not be many voters left to sway. Still, for Obama, solid debate performances could "cement" his lead in these states, Miringoff said. "For the challenger," he added, "it's always the second chance to make a first impression." In the hotly contested Virginia Senate race, Democrat Tim Kaine leads Republican George Allen, 49 percent to 44 percent among likely voters. Last month, Kaine and Allen were tied, 46 percent to 46 percent. From governor's son to presidential contender, a look at the life of Republican Mitt Romney. In Ohio, Democratic incumbent Sen. Sherrod Brown continues to lead Republican challenger Josh Mandel. Brown holds a 50 percent to 41 percent lead, which is slightly expanded from where the race was last month. Brown then led 49 percent to 42 percent. In Florida, Democratic incumbent Sen. Bill Nelson holds a 52 percent to 41 percent lead over Republican challenger Connie Mack. Last month, Nelson's lead was a slightly wider 14 points. The polls were conducted from Sept. 30 to Oct. 1. The Ohio poll has a margin of error of plus or minus 3.2 percent. The Virginia poll is plus-or-minus 3.1 percent. The Florida poll is plus or minus 3.3 percent. The president's fourth year at the White House in pictures — follow along as it happens.